6a architects' Coastal House, Devon, was awarded the Arnold Laver Gold Award and Best in category for Interiors at the 2017 Wood Awards. 6a architects' Cowan Court, Churchill College, Cambridge also received Highly Commended in the Education and Public Sector. The annual awards recognise excellence in timber architecture and were begun in 1971. The 2017 RIBA Stirling Prize will be announced tonight, 31 October 2017, at a ceremony at the Roundhouse, London. 6a architects is shortlisted for its Studio for Juergen Teller, explored in the above film from BBC Arts. 6a architects participated in 'The Trade Show', a collaborative exhibition organised by Faye Toogood as part of this year's London Design Festival. Faye Toogood invited 50 of the leading creative forces in the country to take part; each of the participants were presented with one of her signature Spade chairs (created for this project in a special limited-edition sandcast-aluminium), and in return they donated a representative piece of their own work. 6a's contribution was the 'Dessert Islands', a series of crystal dessert bowls made in collaboration with Viennese glassmaker Lobmeyr. The exhibition drew on the centuries-old tradition of artists supporting each other through mutually beneficial barter – and the result was a celebration of the habit of collection, an auto-curated Wunderkammer that showcased pieces from some of the most exciting talents in contemporary British art and design. 6a architects are participating in the 2nd Chicago Architecture Biennial, curated by Sharon Johnston and Mark Lee under the title 'Make New History', with Returning, a project related to their critically acclaimed work at Spitalfields art centre, Raven Row. 6a architects was one of 16 architectural practices invited to create a 16-foot reinterpretation of the landmark Chicago Tribune Tower, originally designed by competition in 1922. These collectively form ‘Vertical City’, a display in Yates Hall of the Chicago Cultural Center, the Biennial’s main venue. As the original entries for the Chicago Tribune Tower competition were being unloaded, another architectural consignment also ended its transatlantic journey in Chicago. A new exhibit of domestic wooden panels – delicately carved in a fine Rococo pattern in the mid-eighteenth century – arrived to be displayed at the Institute of Art in Chicago and were installed as the “Georgian Room”. By the 1980s the room had returned to England where it stayed in an Essex barn until 2008, when 6a architects reinstalled it in the original building, Raven Row in Spitalfields. For the Biennial, the room in London was measured and the profile of the panelled walls and ceiling drawn as a single continuous line. This was divided into forty sections and mailed with a list of instructions to forty Chapters of the American Association of Woodturners throughout the Midwest states. Each line has been transformed into a hand turned section of the column and assembled. The documents provided by the Chapters are displayed alongside, forming the most recent chapter in the provenance of this well-travelled room. The Chicago Architecture Biennial opened 16 September 2017 and will continue until 7 January 2018. 6a architects has been shortlisted to design the new Citroën Cultural Centre in Brussels, Belgium, together with Belgian teammates architecten de vylder vinck tailleau and AgwA. Housed in a 1930s Citroën car garage in central Brussels, the 35,000sqm building will be a satellite of the Pompidou Centre in Paris. Containing a museum of modern and contemporary art and a museum of architecture, it will be the largest museum built in Brussels since the beginning of the 20th century. The Photography Studio for Juergen Teller has been shortlisted for the prestigious 2017 RIBA Stirling Prize. The award recognises the building that has made the greatest contribution to British architecture in the past year. The building’s nomination comes following its award as London’s Building of the Year by the RIBA in June. The winner will be announced on 31st October at the Roundhouse, London. Andrew Hale interviews 6a architects on art spaces and the future of galleries on Cork Street, London in the Summer 2017 issue of Catalogue. 6a architects, in collaboration with the Belgian practices, architectecten de vylder vinck taillieu, Bureau Barbara Van der Wee, Denis Dujardin BVBA and doorzon interieurarchitecten have been shortlisted to develop a new Maritime Museum on a dry docks site in North Antwerp. The project is part of a masterplan devised by the Flemish Government Architect, Vlaams Bouwmeester and commissioned by AG Vespa and Antwerp City Council, to regenerate nine classified docks into a new ‘Maritime Park’ of which the museum will be the centre point. 6a architects has been shortlisted by S1 Artspace to convert a wing of the Brutalist Park Hill estate into an international arts venue for the production, exhibition and research of outstanding art and culture. Park Hill was originally completed in 1961 and the new 70,000 sqft art space will open in 2022. The Hepworth Wakefield was announced yesterday evening as the winner of the Art Fund’s prestigious award, Museum of the Year 2017. Art Fund director Stephen Deuchar complimented its ‘breathtaking sequence of special exhibitions’. Earlier this year, 6a architects worked with The Hepworth Wakefield to design the exhibition 'Disobedient Bodies: JW Anderson Curates the Hepworth Wakefield', which can be seen in the Art Fund's short film on the museum here. 6a architect's Photography Studio for Juergen Teller has won a 2017 riba National Award. The awards recognise buildings across the uk that make a significant contribution to architecture. The Photography Studio for Juergen Teller has been shortlisted for a 2017 New London Award as one of the best workplaces in the capital. Supported by the Mayor of London, the New London Awards recognise exemplary architecture in the city. The winner will be announced on Wednesday 5 July. 6a architects has been shortlisted by Antwerp City Council to consider the future of the house and grounds of Renaissance painter Peter Paul Rubens. As one of four teams, selected from 57 entries, the practice will prepare strategies to establish new arrival, gallery, education and library buildings on the central Antwerp site. 6a architects’ founding director Stephanie Macdonald will join fashion designer Jonathan Anderson and design historian Emily King in conversation at the Hepworth Wakefield on Saturday 17th June 2017 at 12pm. They will explore the intersecting art and design practices that come together in the collaboration between 6a, Jonathan Anderson and the Hepworth for the current exhibition, Disobedient Bodies: JW Anderson Curates The Hepworth Wakefield. 6a architects has won two riba Regional Awards 2017 and London Building of the year. The studio complex for Juergen Teller won London's Building of the Year at the Royal Institute of British Architects. 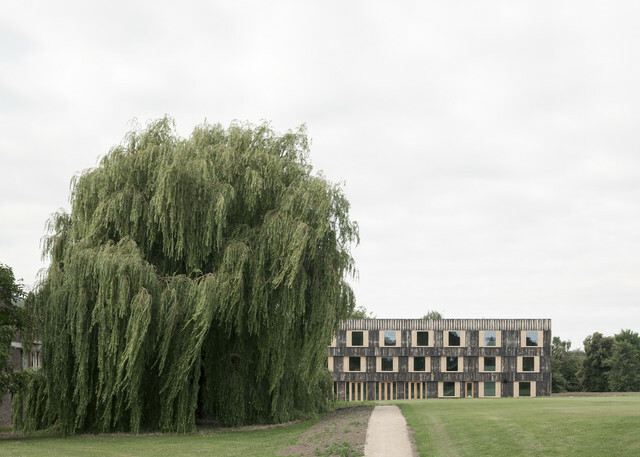 This follows its riba London Award and an riba East Award for Cowan Court, Churchill College, University of Cambridge. Both buildings will now be considered for national riba Awards, to be announced in June. Cowan Court, 6a architects' 68-room hall of residence for Churchill College, University of Cambridge, has won an riba East Awards 2017. The project will now go through to the national awards which take place in June. Two projects by 6a architects have been shortlisted for 2017 riba Awards. Cowan Court is a 68-room hall of residence for Churchill College, University of Cambridge. Completed in August 2016, it is the first completely new court since the Grade-II listed college was founded in the early 1960s. 6a's building transforms the raw sensuality of the original brick- and board-marked concrete into an innovative, contemporary, low-energy timber building. The Photography Studio for Juergen Teller spans a long and narrow plot in west London. 6a designed a series of three individual buildings, comprising offices and archive, a top-lit studio space and ensemble of ancillary rooms. Each unit is punctuated with a garden inspired by those that spring naturally in ruinous or untouched corners of the city. Disobedient Bodies opens at The Hepworth Wakefield. Curated by fashion designer Jonathan Anderson and designed by 6a architects and ok-rm, the exhibition investigates the way the human form has been reconceived by artists and designers across the 20th and 21st centuries. A selection of sculptures, many from The Hepworth’s collection, will be on display alongside notable fashion pieces and objects of craft and design. On Saturday 3rd June Jonathan Anderson will be in conversation with Stephanie Macdonald of 6a architects and design historian Emily King. Tickets are available here. Where does architecture meet art? Where does architecture meet art and how can the seemingly mundane aspects of the city influence creative production, whether that of artists or architects? Richard Wentworth is an artist who works with the familiar and the everyday, yet who finds in the quotidian a kind of human inventiveness that is almost magical. Tom Emerson is an architect whose practice draws upon broader history and culture: film, literature, craft and a world beyond building – which nevertheless is what makes building possible. The talk brings together the artist and the architect, in attempt to trace the seemingly invisible and the ordinary that influence the way we construct, design and reflect upon the world around us. The event is part of a new series on Art and Architecture curated by Edwin Heathcote and hosted by Second Home in East London.